Radiation Oncologists at University Hospital provide the latest advances in prostate seed implantation as an option for the treatment of prostate cancer. 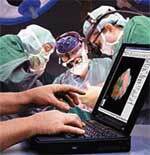 This revolutionary approach utilizes state-of-the-art computer planning software in the operating room to analyze the implant as it is being performed for ideal seed placement. that they will not be felt or noticed by the patient. Real-time dynamic intraoperative planning means critical information is gathered and assessed throughout the implant procedure. The Radiation Oncologist and Urologist know immediately where the seeds are placed within the prostate and how the dose distribution is progressing. This allows doctors to make changes to the original implant plan as needed - in real time. Changes to the plan will be made, for example, because the prostate's shape can change during the time between the pre-treatment planning and the actual procedure. Other changes allow the doctor to deliver more radiation to areas of the prostate that have more cancer. This innovative technique combines digital ultrasound images with state-of-the-art computer planning to provide the experienced implant team with precisely the information they need to sculpt the dose to the prostate. No other technique offers this advantage. Real-time interactive computerized assessment of radiation dose distribution during the prostate implant.